This week's doorway can be found on Commonwealth Ave.
this right here is one of the reasons it is wonderful to walk the streets of boston. Nice photo, especially in B and W. There seems to be quite an eclectic mix of architecture out there in Boston with you, and very photogenic to, by the looks of things. Nice and elegant. Beautiful black and white. 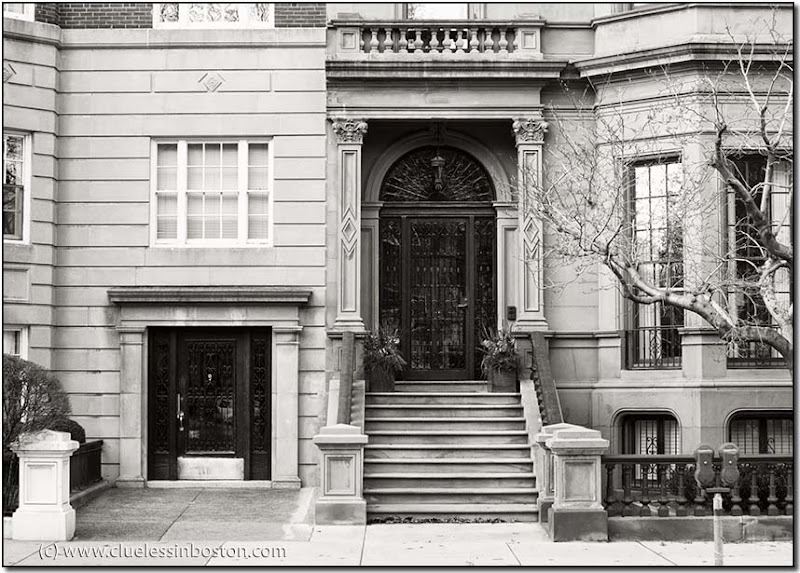 Beautyful architecture!I like that , often, people frame their doors with flowers in Boston. It shows that people care of their town. Very interesting, Clueless. At first glance, it is tempting to gush about the architecture. Then, at second and third glance, we see that the doors and windows are in awkward relation to each other. It is as if the architects of adjoining buildings didn't care about what was going on next door. Very grand. Boston is full of gorgeous buildings.